I recently took a few weeks off of work, spending next to no time at all using a mouse. My computer use was limited to either my Surface Pro as a tablet or my Nexus 6P phone. Upon returning to work, I almost immediately felt discomfort and pain in my right hand. At first, it was not significant, but after a few days of using my mouse again my hand was considerably irritated. Clearly the discomfort was being caused by the use of a mouse. I had often considered an ergonomic mouse in the in the past, but alway stuck with my traditional standard notebook mouse from Logitech. The older Logitech MX Anywhere to be concise. However, the direct correlation between my hand pain and mouse use was enough to kick the search for a better, more ergonomic mouse into full gear. I was strongly considering the Anker offering which looks much like a shark fin. However, after using it on-loan from a co-worker for a week or two, it was too dramatic of a design to be useful for me. I have larger than average hands which made the shark fin design almost more challenging to use than a traditional style mouse. Having used and enjoyed the Bluetooth Microsoft Sculpt Comfort mouse in the past I decided to "pull the trigger" on Microsofts Ergonomic mouse. The Sculpt Ergonomic mouse is shaped much like a baseball and does an effective job of keeping your wrist and hand in a more natural position. When holding a traditional mouse, your radius and ulna are crossed with each other. This will inevitably lead to discomfort. A more natural resting position for your arm/wrist/hand is found when holding your arm on its side, or with your palm up. I have used the Sculpt Ergonomic mouse for a little over two weeks now. I am very pleased with the immediate comfort and relief provided to my hand and wrist in such a short period. The mouse comes with a few useful features as well that any modern mouse should come with at minimum. Those are pretty basic features found on most mice today. However, many ergonomic offerings lack these, as they are focusing on the form, more than the function. The absence of a forward button is unfortunate considering that amount of space available on the thumb side of the mouse. My biggest issue with the mouse is not with the physical mouse itself but rather its choice of connectivity to the PC. In a time where port-limited ultrabooks reign supreme, Microsoft elected to use a 2.4Ghz wireless connection which requires a dongle. Almost all wireless peripherals today are using Bluetooth rather than 2.4Ghz wireless, including many of Microsofts own keyboards and mice. Not only did they choose the #donglelife for users of this mouse, but the size of the dongle used is a bit disappointing. The mouse takes advantage of Microsofts "BlueTrack" technology, which allows users to use the mouse on nearly any surface, including glass and is powered by two AA batteries. 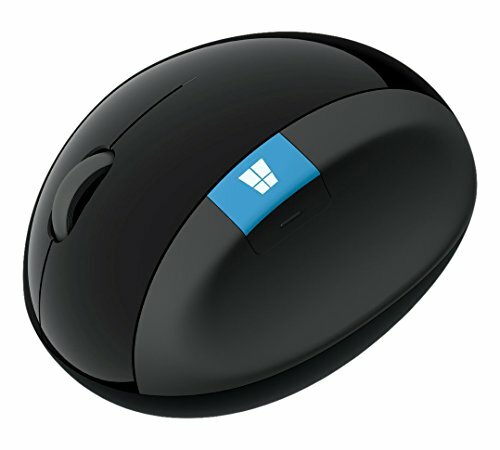 Another thoughtful design choice Microsoft made with the Sculpt Ergonomic mouse is the battery door. Rather than a traditional click-in design, this one uses magnets to keep the door secure. Removing the door also reveals a slot to stow-away the massive wireless dongle for safe keeping while on the go. I would absolutely recommend this mouse over others for users who are either dealing with some sort of discomfort while using their current mouse or simply wanting to make a healthier choice ergonomically to avoid future unwanted pain while using the computer. The Microsoft Sculpt Ergonomic Mouse can be purchased from Amazon for $55.43 CAD with a Prime Membership.